Testing and tagging should be a vital part of any business’ health and safety program. Anmar Solutions’ service, available throughout Airport West, will ensure that your workplace is compliant, safe and running effectively. As an employer, it is your duty under the Victorian Occupational Health and Safety Act 2000 to provide your employees with a workplace that is safe. Check that your workplace is fulfilling this responsibility by contacting Anmar Solutions. Our team is filled with experienced, highly-trained technicians who are managed by a board of directors that have worked in the electrical industry for over 40 years. Our experience, combined with our expertise, means that our service is the best available. This means you can focus on running your business, with complete peace of mind that your workspace is 100% compliant, safe, efficient and in line with current OH&S best practice. Our test and tag service is comprehensive enough that it allows us to be your one-stop shop for your electrical safety and performance needs. 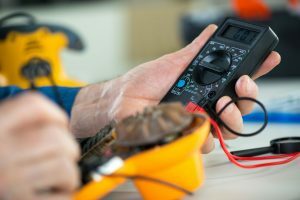 Our experienced technicians will perform exhaustive tests on all of your electrical equipment to ensure it is complaint with AS/NZS 3760:2010. After each piece of equipment has been checked by our state-of-the-art Portable Appliance Tester it will be fixed with a tag and a unique barcode that is linked to our database. A detailed report is then generated and sent out to see the status of your appliances and this can also be used to show authorities that you have taken care of your responsibilities as an employer.